In steadfast continuance of its tradition since its inception in 1854 of maintaining a close association and healthy relationship with the world of art, Louis Vuitton has chosen to associate itself with the first retrospective dedicated to iconic contemporary Japanese artist Yayoi Kusama. This exhibition has been travelling from the Museo Nacional Centro de Arte Reina Sofia in Madrid to the Centre Pompidou in Paris, the Tate Modern in London and the Whitney Museum in New York City. The luxury house celebrated and supported Tate Modern’s exhibition, Yayoi Kusama, with a Yayoi Kusama display, curated shelf and new artwork in the Bond Street Maison. Louis Vuitton’s artistic director, Marc Jacobs, who has over the years given impetus to the House’s ties with art by initiating partnerships with international artists like Stephen Sprouse, Takashi Murakami and Richard Prince, professes great admiration for Kusama’s work. He had encountered the artist in Tokyo in 2006 and is a fan of her sculptures and paintings. “The obsessive character and the innocence of her artworks touch me. She succeeds in sharing her vision of the world with us,” he says. The admiration it would seem, was mutual, and a collection has emerged from the collaboration between Kusama and Jacobs that will interpret her most emblematic artworks. From rural Japan to the New York art scene of the ’6os and ’70s and back to contemporary Tokyo, the avant-garde painter, sculptor and novelist has been at the centre of the art scene for five decades. The origin of her artworks is a hallucination which took place at a dining table. The red flower patterns on the tablecloth started to spread across the walls, the floor and on herself. The artist, born in 1929 in Japan, seized all techniques (sculpture, painting, film-making, photography and writing) to transcribe this disorientation. In the 1950s she became known for her Infinity Nets, monochrome networks composed of a minuscule unique element repeated to infinity. In 1958 she settled in New York and exhibited alongside artists like Claes Oldenburg, Andy Warhol and Donald Judd. 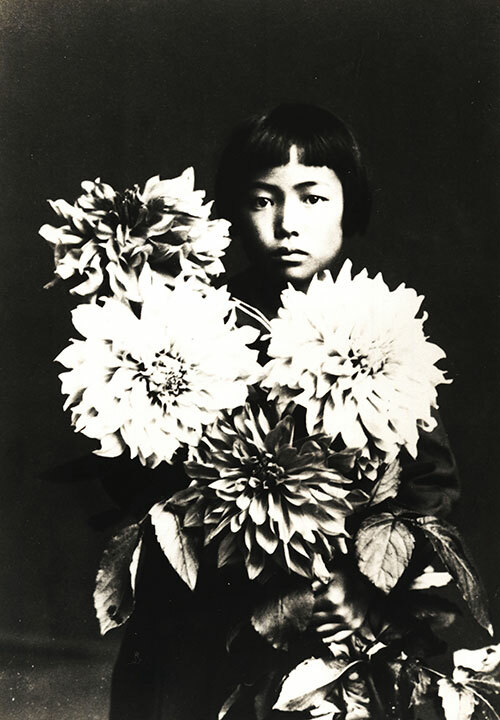 Since her return to Japan in 1973, the artist, who describes herself as obsessive, resides by choice in a psychiatric hospital and goes every day to her studio to work. 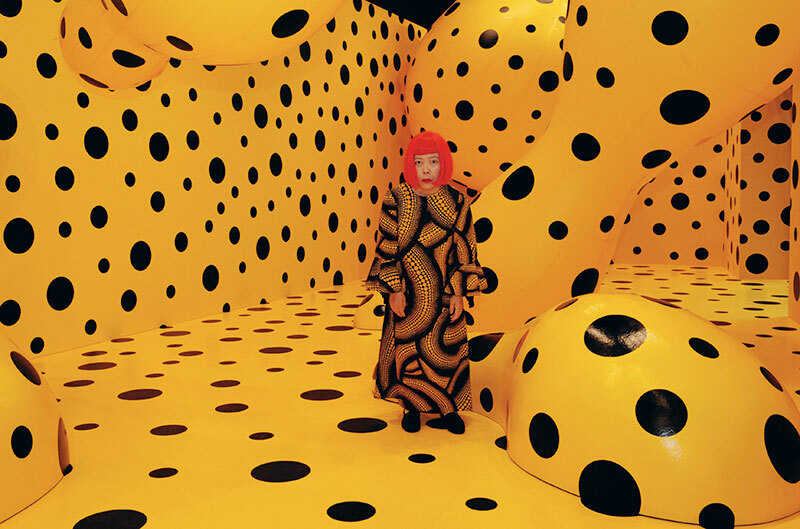 Much of Kusama’s work is marked with an obsession to escape from psychological trauma. Her obsession manifested in particular forms of all-over patterning which became her trademark – the dot. Her repeated dot patterns are cathartic and hypnotic and obliterate any forms underneath. In an attempt to share her experiences, her hallucinations and visions, she creates installations that immerse the viewer in her obsessive vision of endless dots and net or infinitely mirrored space. At the inaugural event of her exhibition at the Tate Modern, the artist made a rare public appearance in a polka-dotted wheelchair, wearing a fringed red wig and red polka-dot dress. It would seem that dots represent her life: ‘A single particle among billions’ she writes in her autobiography. In fact, her mental condition has been channelled into her art, keeping her illness in check, even as she endeavours to immerse us into her world through her immersive installations. The starting points for the Louis Vuitton collection were obsession and seriality. The iconic leather goods, ready-to-wear, shoes, accessories, watches and jewellery became the supports for Kusama’s organic repetitive patterns. Treated in vigorous and hybrid colours, the polka dots cover the products infinitely, expressing the unlimited possibilities of playing with scales, colours and densities. ‘When the Kusumaesque figure comes to life, the patterns ripple and lead the eye into a stroboscopic game. No middle, no beginning and no end’. This hallucinatory proliferation will also be relayed in Louis Vuitton windows worldwide decorated with emblematic motifs – biomorphic shaped ‘nerves’ sculptures for windows named ‘Beginning of the Universe’ flowers entitled ‘eternal blooming flowers in my mind’ and especially red polka dots on a white background among which Kusuma’s figures named ‘self-obliteration’ can be spotted. Kusuma’s polka dots will, in this way, carry her message of ‘Love Forever’ all over the world.